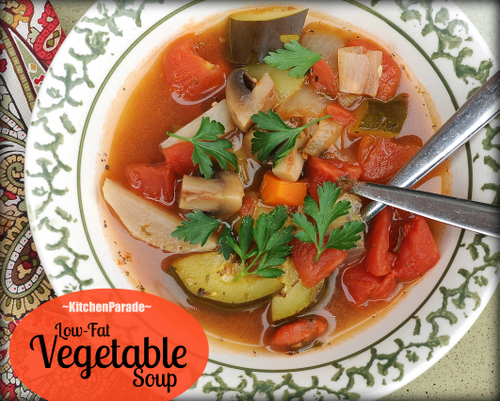 The Recipe: An all-vegetable soup, packed with flavor but made without added fat. This soup is similar to the Weight Watchers Zero-Point Soup. It's a Weight Watchers favorite but tasty for everyone, not just those who follow Weight Watchers. Vegan too! Is anyone else feeling less than svelte after indulging during the holidays? If we’re like millions of Americans, our resolutions for 2004 call for less food and more exercise. As we downsize, this soup will satisfy our yearning for filling, full-flavored fare. It keeps well in both fridge and freezer so keep plenty on hand for fast lunches and light suppers. This recipe has no added fat – and needs none. When making it for the first time awhile back, I employed the standard trick to reduce fat while enriching the flavor in soups and stews. It’s a simple thing, no "trick" really: simply sauté the garlic and onions in a tablespoon of olive oil (typically less than specified) to a deep gold rather than until translucent (the typical instruction). Doing so releases the onion’s natural sugar and can make a big difference in perceived richness. In this soup, however, side-by-side taste tests yielded no difference at all. In Pot One, I threw in all the ingredients, no oil, no cooking. In Pot Two, I sautéed the garlic and onion sautéed in oil first. So nix the oil. Not one drop is needed. "Fat free" goodness doesn’t happen often so with each swallow, let’s just enjoy. Heat a four-quart Dutch oven on medium heat. Add vegetable broth and tomatoes. Add all the remaining ingredients as they're prepped. Cover and bring to a boil. Reduce heat and simmer until vegetables are tender, about 30 minutes. With a slotted spoon, transfer 3 cups of the cooked vegetables to a blender or food processor. Add about 1/4 cup cooking liquid to the blender and purée until smooth. Return the purée to the soup pot. Season to taste with salt and pepper and serve. ALANNA's TIPS This recipe makes a bunch, so make sure your pot is big enough. I usually use two Dutch ovens, rather than dragging out the big stockpot. If you're reducing carbs as well as calories, substitute chopped turnips for the russet potato. CSA members and farmers market shoppers will appreciate the ingredient flexibility of Master Recipe: How to Make Homemade Vegetable Soup. NUTRITION INFORMATION Per Cup: 44 Calories; 0g Tot Fat; 0g Sat Fat; 0mg Cholesterol; 40mg Sodium; 9g Carb; 2g Fiber; 5g Sugar; 3g Protein. WEIGHT WATCHERS POINTS Old Points .5 & PointsPlus 1 & SmartPoints 2 (2 cups=3 SmartPoints) & Freestyle 0 CALORIE COUNTERS 100-calorie serving, 2-1/4 cups (6g protein); 50-calorie serving, generous 1 cup.